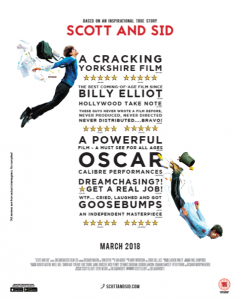 Scott and Sid is based on the real life experiences of ‘Dreamchasers’ Scott Elliott & Sid Sadowsky, who also wrote, directed and produced this inspiring story of triumph against adversity. Schoolboys Scott (Richard Mason) and Sid (Tom Blyth) are isolated, underachieving and a little lost when Scott transfers to Sid’s school as a teen. Sid is the withdrawn, awkward son of an alcoholic mother and absent father, who just wants to work hard, get through his exams and escape into his own life. Scott, meanwhile, is an unloved foster child who’s been expelled from multiple schools, rootless and uncontainable. Neither receives much encouragement from their parents or teachers, but as their friendship takes root they find something in each other that enables them to glimpse a bigger goal. Despairing of the compromise and limited ambitions around them, and in defiance of the low expectations that everyone has for them, Scott and Sid write a list of goals and begin pursuing each one in turn to create a better life. The withdrawn, overly serious Sid is inspired by Scott’s wild and untamed spirit, while Scott draws strength from Sid’s boundless work ethic and determination to get ahead. They become ‘Dreamchasers’, building their whole lifestyle and ideology around pushing themselves farther and faster than anyone expects. Fuelled by ambition and entrepreneurial spirit they launch two successful businesses while still at school, and by their late teens they’re reaching for the stars – even if it means putting themselves in real danger from gangsters and loan sharks.